Local school districts react to Gov. DeSantis executive order to eliminate Common Core. 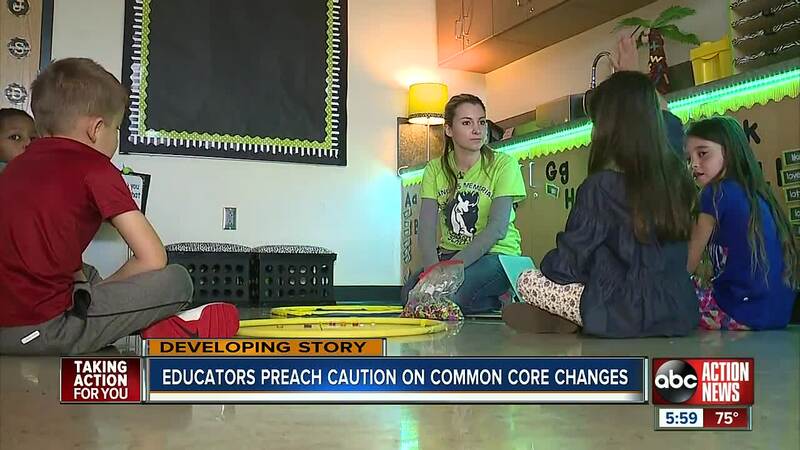 Florida Governor Ron DeSantis signed an executive order this week to eliminate Common Core from schools in the state. He cited frustrated parents and testing as reasons for the order. "I commend the governor for taking bold stands and staying true to his promises. I completely support streamlining standardized testing, increasing civics education, and improving literacy. However, I ask Governor DeSantis and Education Commissioner Corcoran to consider the amount of time, funding, and effort teachers, administrators, and school districts have invested in professional learning, curriculum, materials, and resources that align with our current standards. I understand that parents have had difficulty grasping some of the standards, and there may be a need to adjust some of them. My concern is that we not lose ground in the progress we have made toward ensuring our students are prepared for the demands of college and the workforce.We look forward to working with our state leaders to assure that the development of new K-12 standards is deliberate and focused on preparing all students for success in college, career, and life." On Friday, ABC Action News spoke one on one with Superintendent Kurt Browning. He knows how much it has taken to get this far under the current standard. He said it has cost school districts hundreds of millions of dollars in professional learning. "We're finally getting it and now we're going to have to change this....the way we think (and) the way we teach and what we teach," Browning said. Browning stated it has been a heavy lift to get teachers to change the way they think and how they teach. He said they have to start over again. He said he does not have a problem with reviewing the current standard, but he hopes everything that has been invested like time, training, and money will not be lost. "I want to be part of the solution. I don't want to be a naysayer, but (I) also want to provide a voice of reason and say, you know, let's not throw everything out that we've done because we've seen great results with that," he said. “As Superintendent, I feel it’s always a good idea to look at current systems in place to see if there’s a better and more efficient process, especially when it comes to the success of our students. No matter what, our teachers here in Citrus will continue to engage and mold students to their fullest potential. In 2014, Florida updated the standards to include calculus and cursive writing as well as making other changes, and re-named them the Florida Standards. With each change to the standards comes a need to re-write and re-purchase assessments which are used to ensure students' mastery of skills. The need for assessments for certain subject areas and at different grade levels are written in statute, which can be changed by the legislature. We have also reached out to Pinellas, Manatee, and Hernando counties for statements, but have not heard back from them yet. According to the executive order, the commissioner of education has to give the governor his recommendations with your input by Jan. 1, 2020.